Find A Grave Memorial# 78700062. 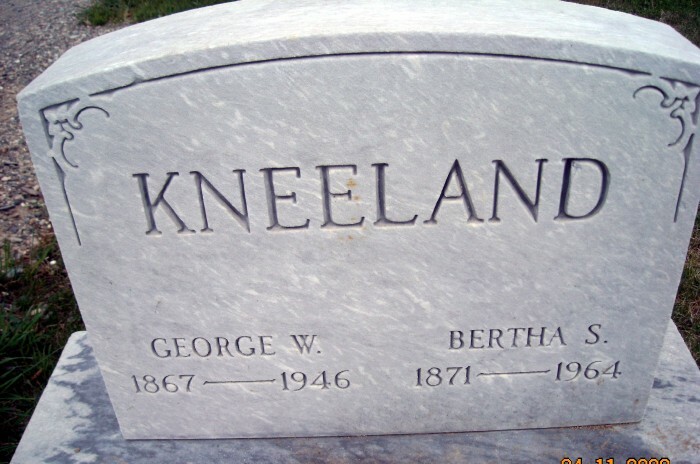 "Maine, Births and Christenings, 1739-1900," index, FamilySearch (https://familysearch.org/pal:/MM9.1.1/F498-WCM : accessed 28 Nov 2012), George W Kneeland, 11 Nov 1867; citing reference , FHL microfilm 9815. "Maine, Vital Records, 1670-1907 ," index and images, FamilySearch (https://familysearch.org/pal:/MM9.1.1/VZQL-KB7 : accessed 27 Nov 2012), G Willie Kneeland and Bertha A Staples, 1897. 1910 United States. Bureau of the Census. 13th census, 1910 population census schedules, Washington, District of Columbia: Bureau of Census Micro-Film Lab, ([19--?]) 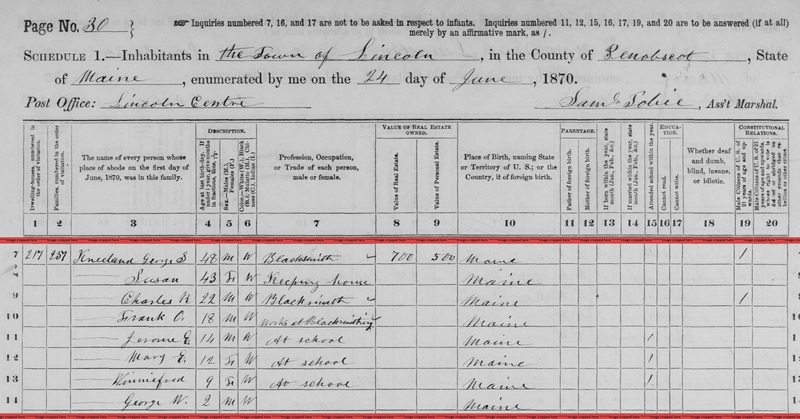 , Census Place: Lincoln, Penobscot, Maine; Roll: T624_544; Page: 13A; Enumeration District: 0181; ; FHL microfilm: 1374557. 1920 United States. Bureau of the Census. 14th census, 1920 population census schedules, Washington, District of Columbia: The National Archives, ([193-?]) , Census Place: Lincoln, Penobscot, Maine; Roll: T625_646; Page: 5B; Enumeration District: 112; Image: 633. 1930 United States. Bureau of the Census. 15th census, United States, 1930 federal census : population schedules ; NARA microfilm publication T626, Washington, District of Columbia: Bureau of the Census Micro-Film Laboratory, ([19--?]) , Census Place: Lincoln, Penobscot, Maine; Roll: 837; Page: 30A; Enumeration District: 67; Image: 896.0; FHL microfilm: 2340572. 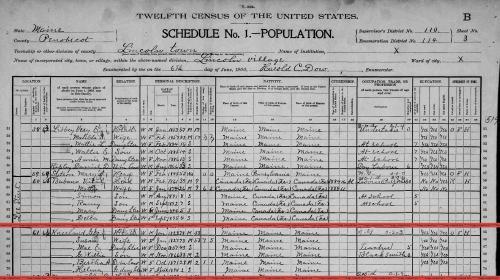 Sixteenth Census of the United States, 1940, Washington, D.C.: National Archives and Records Administration, (1940) , Census Place: Lincoln, Penobscot, Maine; Roll: T627_1487; Page: 5B; Enumeration District: 10-84. "United States World War I Draft Registration Cards, 1917-1918," database with images, FamilySearch (https://familysearch.org/ark:/61903/1:1:QJDG-WY46 : 11 June 2014), Guy Franklin Kneeland, 1917-1918; citing Mason County, Washington, United States, NARA microfilm publication M1509 (Washington D.C.: National Archives and Records Administration, n.d.); FHL microfilm 1,991,725. "Maine, Vital Records, 1670-1907 ," index and images, FamilySearch (https://familysearch.org/pal:/MM9.1.1/VZQL-K1S : accessed 27 Nov 2012), G W Kneeland in entry for Helena Kneeland, 1898. Hugh (Bud) Franklin Kneeland was born on November 8, 1926 in Tacoma, Pierce County, Washington. Hugh attended school in Buckley, WA. He was inducted into the U.S. Army in 1945. As a young man, Hugh worked as a movie projectionist and met his future wife, Anna, while both worked at a Puyallup movie theater. "Maine, Births and Christenings, 1739-1900," index, FamilySearch (https://familysearch.org/pal:/MM9.1.1/F498-WHG : accessed 28 Nov 2012), Jerome Elkins Kneeland, 17 Feb 1856; citing reference , FHL microfilm 9815. Ancestry.com, U.S. City Directories, 1821-1989 (Beta), [database on-line]. Provo, UT, USA: Ancestry.com Operations, Inc., (2011) , Washington > Tacoma > 1945 > Tacoma, Washington, City Directory, 1945 > 282. 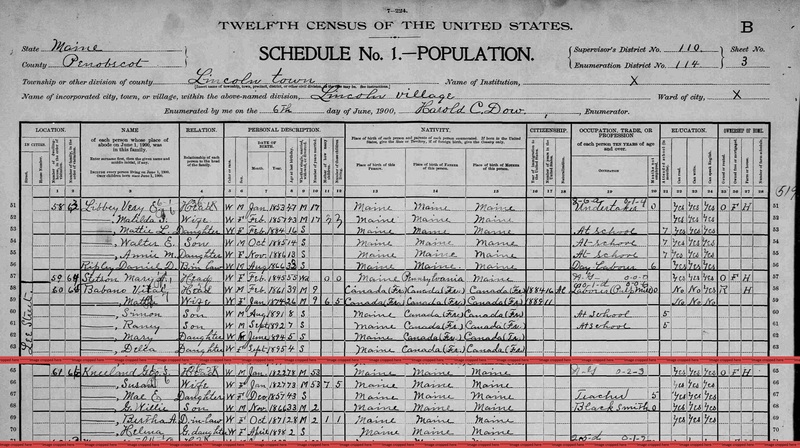 "United States Census, 1930," database with images, FamilySearch (https://familysearch.org/pal:/MM9.3.1/TH-1942-22786-17052-41?cc=1810731 : 8 December 2015), Washington > Pierce > Tacoma > ED 143 > image 6 of 20; citing NARA microfilm publication T626 (Washington D.C.: National Archives and Records Administration, 2002). "Maine, Births and Christenings, 1739-1900," index, FamilySearch (https://familysearch.org/pal:/MM9.1.1/F498-W4F : accessed 28 Nov 2012), Mary Ella Kneeland, 15 Dec 1858; citing reference , FHL microfilm 9815. 1920 United States. Bureau of the Census. 14th census, 1920 population census schedules, Washington, District of Columbia: The National Archives, ([193-?]) , Census Place: Lincoln, Penobscot, Maine; Roll: T625_646; Page: 5A; Enumeration District: 112; Image: 632. Ancestry.com. Web: Tacoma, Washington, Obituary Index, 1882-2015 [database on-line]. Provo, UT, USA: Ancestry.com Operations, Inc., 2011. "Maine, Vital Records, 1670-1907 ," index and images, FamilySearch (https://familysearch.org/pal:/MM9.1.1/VZQL-J6G : accessed 27 Nov 2012), G Will Kneeland in entry for Kneeland, 1906. Find A Grave Memorial# 78700331. Robert married Catherine M. Levine, daughter of George J. Levine and Susan M. Hurton, on October 5, 2008. Robert G. Kneeland is online at https://www.facebook.com/bkneeland3369. "Washington, County Marriages, 1855-2008", database with images, FamilySearch (https://familysearch.org/ark:/61903/1:1:QKNB-9T1T : 22 October 2015), Roy Lynn Kneeland and Hazel Lillian Haydon, 1925. Ancestry.com, U.S. City Directories, 1821-1989 (Beta), [database on-line]. Provo, UT, USA: Ancestry.com Operations, Inc., (2011) , Washington > Tacoma > 1947 > Tacoma, Washington, City Directory, 1947 > 278.